AFC - 11/26/05 Protest Against the Beagles' Torturer! 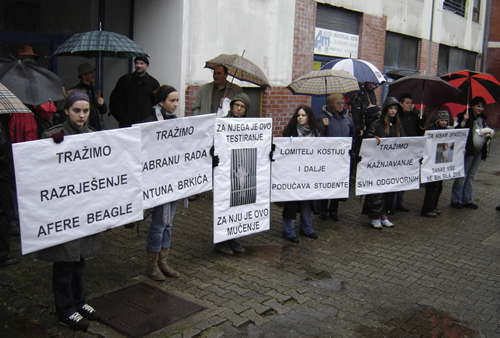 Four months ago, at the time when the general Croatian public was already informed about the dirty affairs at the Faculty of Veterinary Medicine and the beagles kept in smelly, narrow cages, dr Antun Brkic had the nerve to perform arbitrary and ruthlessly arrogant experiments on dogs that were officially in quarantine, during which he and his co-workers fractured bones of 22 beagle dogs. The bone fracturing was performed despite the fact that this "scientific" project was not ratified by the ministries in charge and against the decisive protest of societies for protection of animals' rights, celebrities, Croatian media, and general public. Nevertheless, Antun Brkic is still holding his teaching position at the Faculty of Veterinary Medicine. Animal Friends invites all citizens to a protest, demanding that all those who are responsible for the beagle affair finally be punished. Antun Brkic should immediately be suspended from his teaching position at the Faculty of Veterinary Medicine. 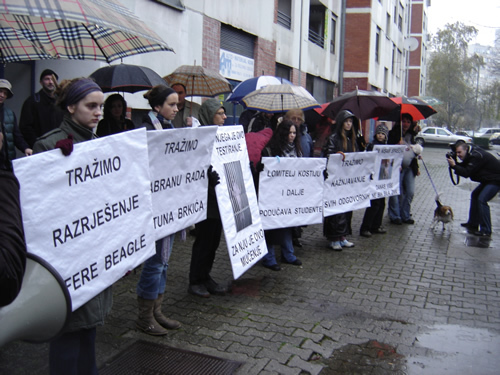 We also demand that Antun Brkic be expelled from the academic and scientific community, which has, because of its inertia, tolerated among its ranks a failed, would-be scientist, who claims to be morally and ethically justified in torturing and abusing animals. The protest with banners and a megaphone will take place on Saturday, November 26, 2005, at 12:00 noon, in front of the building in Dugave, Hribarov prilaz 9, where Antun Brkic lives. The rescued beagle dogs, which suffered by having their bones sawed by Brkic and were meant to be killed after several months of experiments, will be present as well. According to the mentioned law, experiments on animals are admissible only if the supposed pain, suffering, or injury inflicted upon them can be ethically justified through the expected results, which should be of significance to humans or animals, i.e. science, which was not the case. 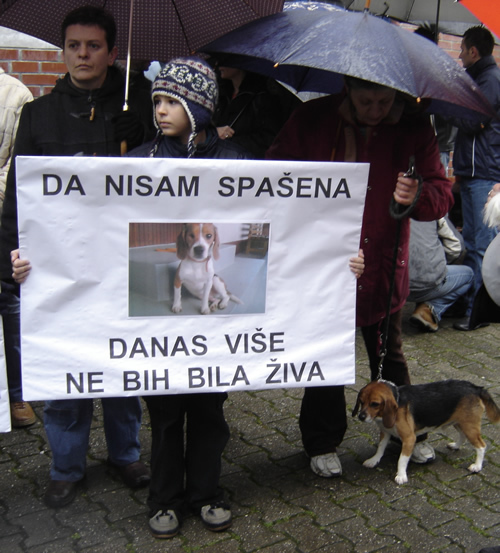 Such crime, which has no precedents in the history or practice of Croatian veterinary medicine or science, undoubtedly points to the circumstance that the existing flaws in the present Animal Welfare Act are being used in order to torture animals for personal interests. Therefore, we demand that the prospective Animal Welfare Act should include establishing an Ethical Committee, which would control all experiments and thus be able to use the law in order to prevent and rigorously punish arbitrary and cruel torturing of animals.